If indeed the intent is to address the “pace of play,” simple math would confirm that allowing less time (pace) to take a shot (play) is a viable resolution. Of course “pace of play” is as subjective as a striped dress. To consider this the answer to basketball’s woes is shortsighted. The elimination of five seconds from the shot clock was lobbied for harder than America Works and now that it’s here, I want to ask: who does this actually favor? Because college basketball has wild talent discrepancies and what’s made milking a 35-second shot clock so successful is that it’s a lot easier to teach a defensive squat than an elbow jumper. Hacking 14% of a possession means the broad dearth of offensive talent will have more opportunities to stink while presumably already good defenses will defend for less time (easier). Imagine those sequences when Oregon State did nothing for 32-seconds, fired an off-balance GP2 grenade, only to see it rebounded by Daniel Gomis and chucked out to mid-court for a fresh 35. Now it’s just a fresh 30, which has a distinct collegiate feel. Maybe we can start calling offensive rebounds frat suitcases? But ultimately Oregon State was pretty successful in doing this and a shorter clock won’t deter them from continuing. We just watched six games of LeBron James fading and muscling at the end of 24-second shot clocks. Through the NBA playoffs, Cleveland took 11.8 shots per game with 4-seconds or less on the shot clock. That’s two-and-a-half more tardy field goal attempts than any other playoff team. James took 4.7 of those which was 74% more than any other playoff participant. We’ve lauded the Warriors for playing a modern version of basketball but what Cleveland did was equally as modern: slow the hell out of a game to give less talented players an opportunity to defend and hope a few shots fall. 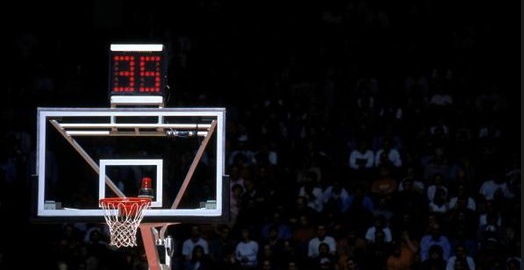 So back to my original question: Who does the shot clock favor? It ultimately favors the better offensive players. Teams will inevitably be forced into late shot clock situations – either by defensive opposition or offensive strategy – more frequently and the teams with the best creators will prosper. Let’s pour one out for the overzealous, undersized guards who will no longer get to draw this whistle and unnecessarily rip the ball from the opposing guard. Of course sometimes they’ll do some really aggressive clapping, too. But the ball rip is definitely gone. This rule will not behoove Stanford. I can’t quantify this but I’ve never enjoyed a Cardinal play out of a timeout so forcing a use-it-or-lose-it first half timeout on Johnny Dawkins will yield some timeouts into play calls that will indubitably have you face/palming. I read once that John Beilein regularly leads the nation in points out of a timeout yet I’ve never been able to find this stat in aggregate. If you know where, please share because I imagine the numbers would prove a vast discrepancy between how we feel about out-of-timeout play calls and reality. What this rule change ultimately addresses is the “pace of viewership” (along with some of the other timeout related switcheroos). It limits a team’s ability to stutter the game into the final buzzer. I’m down with it. This rule could have a much larger affect than it would seem. College basketball is a coach-dominant game. They’re the face of the program and generally control everything about it. So taking this game control from their hands could lend us to scenarios when 18-year-olds are forced to play out situations they’re completely overwhelmed in and so what’s the worst that could happen? Our good friend and current Mississippi State Head Coach, Ben Howland, was famous for this at UCLA. We’d be approaching the 12-minute mark and – from the bench – the lead Bruin would request a stoppage of play, coupling his request with the previously scheduled stoppage. It’s just a longer break. And now he – and other coaches – can do neither. I think this one is pretty obvious in how it address “pace of play.” But let’s flash forward to March (March!). That’s when everyone’s paying attention to college basketball and so that’s when the ad dollars are really pouring in. It’s when ad creativity is flowing. It’s brought is NanananaNapa, Shaq and this slipper, and Chuck’s wish. We’re going to get less of this now. Are you cool with that? (I am). Pregame dunking is allowed – WHAT A RELIEF!